Revus Sarvani, a Dunmer merchant, is the owner of Dusty the silt strider, and can be found southwest of the Sun Stone, northwest of Tel Mithryn. He personally trained Dusty since she was a larva, and is staying with the now-elderly silt strider until she passes in peace. He sells a variety of items, including a Kagrumez Resonance Gem which can be used for the related quest. Even if the small camp has a tent and a bedroll, Revus never sleeps. Instead, he spends all of his time wandering, eating, warming his hands by the fire, or just relaxing. He wears the outfit and shoes of a Dunmer and carries a leveled dagger, as well as an assortment of ingredients and other items, all of them for sale. When he sees you, he will ask: "From that look on your face I'm guessing you've never seen a Silt Strider before?" He will then proudly introduce Dusty: "This is Dusty. I personally trained her from a larva. Feels like a lifetime ago now. She hasn't been in traveling condition for quite a while now. I've tried to let her go off on her own but she insists on staying here." When asked how he can survive in the middle of nowhere, he will answer: "We get by trading odds and ends with the locals. I've decided to stay here and make sure she passes in peace. It's the least I can do for her. Every once in a while a local makes it out here. Although, they usually just want to catch a glimpse of Dusty. Silt Striders are pretty rare now." He will then tell you more about the famous silt striders, and you can choose between two questions. On why they are so rare, he will explain: "The blast from the volcano wiped most of them out. Found Dusty here in a small cave on Vvardenfell. Silt Strider cocoons are pretty tough." Lastly, he will explain what silt striders were used for: "Mostly for transporting goods and people. They were pretty commonplace in Morrowind, but that was ages ago. A Silt Strider carapace is so strong it can withstand the harshest of weather. 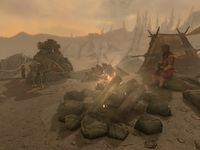 Even the legendary sandstorms of Vvardenfell's Molag Amur Region were said to barely make a dent in them. Of course, that's all ash now." With the Nix-Hound Creation installed, Revus will have a tamed nix-hound at his camp and will send you a notice of sale offering to sell it to you as a pet. You can purchase it from him for 400 gold by saying "I'd like to purchase the Nix-Hound", to which he will wordlessly hand you a spell tome. If Revus is dead prior to installing the Creation, the nix-hound will instead be passed on to Geldis Sadri in Raven Rock who will offer to sell it on his behalf. The Kagrumez Gauntlet: Survive the Kagrumez trials to claim a unique prize. Revus Sarvani is a member of the bandit class, which determines the level of his skills. He is not affected by the Master Trader perk. All of his initial items for trade can be pickpocketed. However, items sold to him cannot be pickpocketed back. He bears the same name as the author of Light Armor Forging. His silt strider is meant to remain static, and therefore doesn't actually move from its position. A quote by a Revus Sarvani appears on the loading screen for Dreudurai Glass Mine in Elder Scrolls Online. This page was last modified on 8 April 2018, at 17:25.